Time is changing and technology has been developed exponentially for past few years. There was a time when a guy that does not have programming knowledge, could not even imagine to create custom designs on a dynamic web platform. The only way to create websites without HTML/CSS knowledge was static website builder softwares. But the huge problem with these static website builder softwares, is that most of them generate poor and non standard HTML and thus, websites created with these softwares look ugly and these softwares are not SEO friendly at all. Other big problem with these website builders is that they are not so much flexible and don’t allow web designer to create high quality designs. As a matter of fact these softwares can’t make you a complete web designers and these are only helping softwares that may reside on periphery of your business. However Serif Webplus is an exceptional Website builder with which you can create stunning and professional websites with many integrated dynamic features. Well, I will tell you more about Webplus later. In this post, I need to explore WordPress as a complete way to setup your web design business without writing a single line of code (HTML,CSS,PHP). All you need to have some of WordPress plugins, themes and a Web Hosting account. I think it is the best tool to create custom layouts with WordPress. 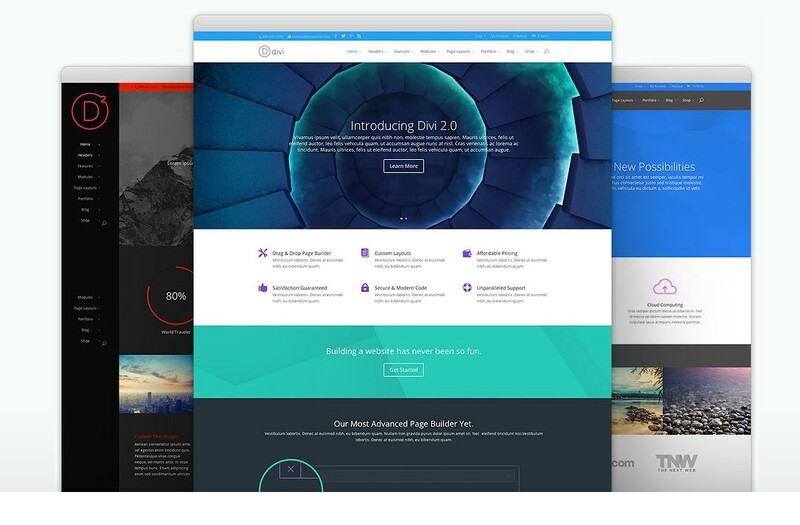 Divi is a part of Elegant Theme membership with which we get more than 80 premium WordPress themes ( and more are coming in future ) and 4 plugins ( more may come in future ). Divi is the most advanced theme of Elegant Themes club membership. Divi enables use to create any type of layout without any knowledge of CSS,HTML and PHP. It includes a page builder that is attached to every post,page or any custom post type and this page builder works on drag and drop module mechanism. Divi page builder offers all kind of essential and advanced modules to add in page builder canvas. Some of the important modules are slider, photo gallery, sidebars, text/HTML, sections, row, portfolio, filterable portfolio, audio player, tabs, accordion, full width header, full width menu, login form, map, testimonial and a lot of other modules. With the help of sections and rows, user can create complex and advanced layouts within minutes. Sections has easy CSS customization options such as background color picker, background image picker, background video option, Parallax effect, custom CSS Class and ID. You can divide a row into different type of column structure and can drop modules in every column separately. Every module has its own custom options including CSS class and ID. Other than Divi, Elegant Themes members get many other awesome themes including Real Estate website builder theme, Directory website builder Theme, shopping cart website theme, Review Rating website theme, Magazine themes, Blog Themes and Question Answers themes like Yahoo Answer, Wiki Answer etc. Members also gets some amazing premium plugins that can be used with any WordPress theme such as Layout builder plugin ( similar to Divi Page builder, Shortcode Generator, Maintenance mode and oming soon, Mobile website builder plugin. It is its own kind of unique layout builder theme ( I use this theme on webcusp.com ). However this theme might not suite a beginner user because its control panel and the way it works may be hectic for a user who would just start using WordPress or just start using this theme. But after cudgeling their brains a bit, they find that the theme is awesome and have innumerable possibilities to create not only layouts but also page templates (no any other theme offers page templates creation). Apart a complete builder theme in itself, this theme is packed with stunning plugins that adds more glow to your web pages. Some of packed plugins are Visual Composer, Showbiz Teaser Carousal, Go Responsive Portfolio, Essential Grid, Ultimate Addon for Visual Composer, Slider Revolution. ( all these plugins, if purchased independently, cost more than $150 (per website) I think but with Ultimatum Theme, these come fully free and can be used on unlimited websites with Ultimatum theme. Showbiz teaser thumbnail carousal – Best thumbnail scroller plugin that supports all post types. Show posts from any category,tag or create a thumbnail scroller by uploading your own images. No one can imagine a successful web design business without having a tool that could create advanced forms for websites. Formidable Pro is a complete tool to create forms, payment Forms, data management, directory listing website and to create advanced custom posts from frontend. With Formidable Pro, it is possible to display gathered form data on WordPress pages. Its developer package allows you to use plugin on unlimited websites including your client websites. You can create a frontend panel to access user profile,posts,pages and enable your clients to manage all of these from frontend without providing access to backend. If you run web design company with WordPress, you need solid backup restore tool that could backup, migrate and restore WordPress websites without any hassle. Only Backupbuddy offers easy to use site backup/restore facility without breaking anything in the site. You do not need any advanced knowledge to restore WordPress websites or transfer WordPress from one domain to any other domain or directory ( changing website URL). We recommend you to buy Backupbuddy Unlimited Lifetime license. When we design sites for clients, we would not want to place a “comment form” under the layout we created. There are many free plugins to disable comments and it is one of them. Admin bar appears on frontend when users are logged in. You should disable it for your web design client. Disable WP Admin Bar Removal is a free plugin to remove admin bar on frontend easily. If you use WordPress for web design, it would be really a great way to earn money by designing and developing client websites even you know nothing about web programming. All you need to playe with web hosting control panel and WordPress basics that is really a fun. Think of all the heartache you’re causing in the world, posting things like this. I’m currently working on a WordPress site that was built by someone who is going around town claiming to be a web developer, who obviously doesn’t know the first thing about WordPress or code and who shouldn’t be given the notion that they have the ability to run a business for it just because they want to. These people waste time and money and leave a trail of tears in their wake. Are you sure you want to be a part of that? I realize you probably won’t post this comment. But, hopefully you’ll at least read it and understand it. Whether it is WordPress or any CMS or any PHP software, they all have purposefully been designed to help web designers. Anybody by consulting a good guide and who has a basic understanding and the knowledge of the computer and the internet can use and take advantage of these utilities. I admit that you have every right not to be satisfied with the work of that person who designed your website with the help of WordPress, but then again, he must not have a good knowledge of WordPress. The point is that it’s him who is to blame and not WordPress because apparently he did not make the most of WordPress. It’s absolutely wrong here to blame WordPress. If a doctor fails to treat and prescribe his patients good medicines, who will account for that? There’s no two ways about this that it’s doctor’s fault and not medicine’s. WordPress is a unique and novel platform. Just put it to proper use and you can design your website, can design websites for others and also can add a myriad of custom functionalities. And it’s not just me, everybody says so. You should be thankful for WordPress because only WordPress made it possible for the person to build your website and you have your own website to work. Just imagine a naive web designer who using PHP or ASP builds an incomplete, shoddy custom web application for you and then disappears. If so, how would you edit that custom web application? In that case you would have no choice but to get your website designed anew. WordPress is a boon for the web world which enables anyone to start his own web design business with literally no programming knowledge at all. Now, if someone fails to learn even WordPress, it’s awful. Besides, everything or every tool has its own limitations. If a web designer employs WordPress, he’d better avoid using WordPress for such projects which are beyond the capacity of WordPress. For instance, WordPress is not yet CMS of choice for the purpose of building a social networking website. So when a client asks you for such a website, you’d better use an appropriate turnkey social networking script such as phpFox or SocialEngine (which are excellent software to build a state-of-the-art social networking website) rather than WordPress. Sorry Mark. I can’t agree with you on this matter and I think any knowledgeable and sensible would hardly agree with you as far as the present matter is concerned.